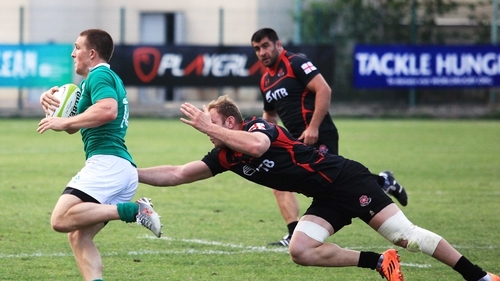 Emerging Ireland made it three bonus point wins on the trot as they saw off the challenge of hosts Georgia before lifting the World Rugby Tbilisi Cup for the first time. After a tight first half, Allen Clarke's young side cut loose with five second half tries - Matt Healy, Eoghan Masterson, John Cooney, Andrew Conway and Finlay Bealham all touched down - giving the Rugby World Cup-bound Lelos a heavy beating in front of the watching Joe Schmidt. 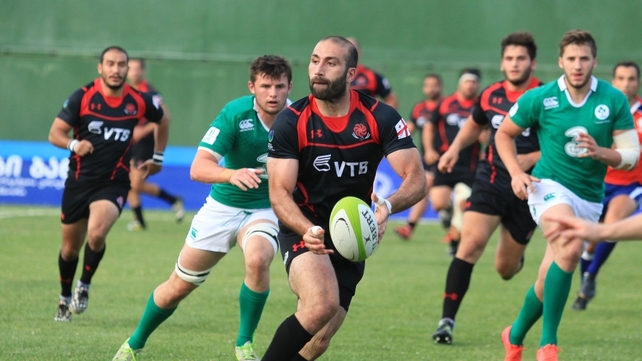 The Georgians scored two tries through their forwards, with number 8 Lasha Lomidze's sixth-minute effort giving them an early lead and replacement lock Otar Giorgadze being driven over before the hour mark. However, Emerging Ireland, who led 10-5 at the break thanks to a penalty try, dominated the final quarter with Cooney, Conway and Bealham all scoring in a profitable nine-minute spell. Georgia were hurting from their surprise midweek loss to Emerging Italy, a result that confirmed the Irish as champions before the final round, and a bout of early pressure led to Lomidze making the try-line under a pile of bodies. Beka Tsiklauri, who missed an earlier drop goal effort, hit the post with his conversion attempt from wide on the right. Already missing injured captain Rhys Ruddock, Emerging Ireland lost his replacement Billy Holland to an ankle injury with Andrew Browne coming on in his place. The Irish began to find some space in midfield with Noel Reid threatening and Jack Conan and James Cronin carrying aggressively around the fringes. Their opening points came from a scrum penalty converted by JJ Hanrahan. As the game began to open up, Conway threatened from Luke McGrath's quick tap penalty and Healy had a couple of runs in off his left wing. However, a combination of determined Georgian defence and Irish knock-ons left the scoreboard unmoved. A tremendous counter-attack from Healy should have led to a try, but the Lelos scrambled back well. Yet, they had no answer to a subsequent lineout maul from a penalty in the 22, Ben Marshall tapping down neatly to Masterson to set up the drive and the Georgians' infringing resulted in a penalty try. Hanrahan added the extras and following a period where neither side could penetrate, the Kerry man miscued a late penalty from halfway as a competitive first half came to a close. With Dan Leavy putting in a big shift up front, Emerging Ireland increased their accuracy and tempo on the resumption and it quickly paid dividends as Healy did well to hold onto Cooney's flat pass and score from close range. Hanrahan's conversion made it 17-5 and Georgia were down to 14 men just two minutes later, as Alexandre Khutsishvili saw yellow for a deliberate knock-on as the fast-breaking Conway threatened to put the supporting Leavy away. 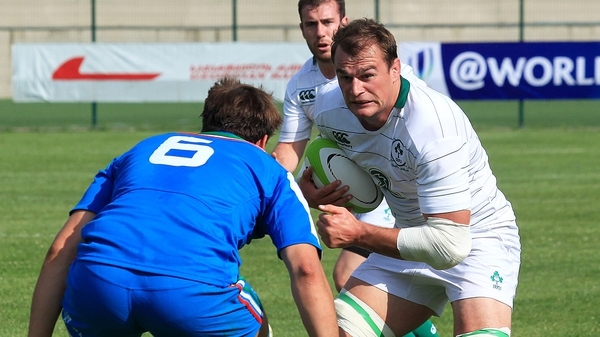 Emerging Ireland followed up with arguably their best try of the tournament. Hanrahan sparked a long-range break on the left, Healy and Stuart McCloskey linked near the touchline and the latter's clever kick through was retrieved by Cooney. A quick recycle and lovely hands from Stephen Archer and Conan sent Masterson over for a memorable seven-pointer. The Georgians showed their mettle by answering back within six minutes, a muscular maul near the right corner putting Giorgadze over and Tsiklauri's conversion made it a 12-point game. The benches were in full flow but as the Georgians tired, Emerging Ireland exploited the space afforded to them. Cooney showed a clean pair of heels to three defenders as he scooted over straight from a scrum in the 22. Hanrahan converted for 31-12. Conway finished smartly for a deserved try with seven minutes remaining, and some terrific interplay between backs and forwards led to try number six. From a speedy Hanrahan-inspired break, Conan burst through a gap in the 22 and his inside pass sent replacement prop Bealham over just to the right of the posts. Hanrahan's sixth successful conversion brought the curtain down on another title-winning summer campaign for Emerging Ireland as they added the Tbilisi Cup to last year's Nations Cup win. Georgia: Beka Tsiklauri; Alexandre Khutsishvili, Revaz Gigauri, Tamaz Mchedlidze, Giorgi Pruidze; Mamuka Ninidze, Giorgi Begadze; Zurab Zhvania, Simon Maisuradze, Anton Peikrishvili, Levan Datunashvili (capt), Konstantine Mikautadze, Beka Bitsadze, Giorgi Chkhaidze, Lasha Lomidze. Replacements used: Otar Giorgadze for Datunashvili (10 mins), Saba Shubititdze for Lomidze (31), Jaba Bregvadze for Maisuradze, Irakli Mirtskhulava for Peikrishvili (both 48), Irakli Svanidze for Pruidze (58), Vazha Khutsishvili for Begadze (63), Giorgi Tetrashvili for Zhvania (73). Not used: Giorgi Aptsiauri. Emerging Ireland: Tiernan O'Halloran (Buccaneers/Connacht); Andrew Conway (Garryowen/Munster), Stuart McCloskey (Ballynahinch/Ulster), Noel Reid (Clontarf/Leinster), Matt Healy (Lansdowne/Connacht); JJ Hanrahan (UL Bohemians/Munster), Luke McGrath (UCD/Leinster); James Cronin (Dolphin/Munster), Rob Herring (Ballynahinch/Ulster), Stephen Archer (Cork Constitution/Munster), Ben Marshall (Old Belvedere/Connacht), Billy Holland (Cork Constitution/Munster) (capt), Eoghan Masterson (Corinthians/Connacht), Dan Leavy (UCD/Leinster), Jack Conan (Old Belvedere/Leinster). Replacements used: Andrew Browne (Galwegians/Connacht) for Holland (7 mins), John Cooney (Terenure College/Connacht) for McGrath, Denis Buckley (Corinthians/Connacht) for Cronin (both half-time), Eoin Griffin (London Irish) for McCloskey (58), Peter Nelson (Malone/Ulster) for Reid (68), Frankie Taggart (Belfast Harlequins/Ulster) for Marshall (70), Dave Heffernan (Buccaneers/Connacht) for Herring, Finlay Bealham (Corinthians/Connacht) for Archer (both 73).